Initially intended for the treatment of hereditary single-gene defects, most gene therapies are also aimed at acquired diseases such as cancer, cardiovascular, and neurodegenerative pathologies. The recrudescence of viral vector-based preclinical and clinical trials is attributed to the advances made in developing new viral vector systems guided by safety, specificity, and potency considerations. While substantial efforts have been made in fine-tuning plasmid vector design to improve titer and transgene expression, one of the current bottlenecks that needs to be addressed is the transition from small-scale development toward a large-scale manufacturing process that can support potential commercial requirements. While stable viral production would at first appear to be the easiest option, there are considerable drawbacks, with respect to generation of efficient producer cell lines and maintenance of reproducible titer yields over time. Therefore, the majority of virus production is currently achieved by transient gene expression (TGE) (Merten et al., 2016). Considerable efforts have thus been made to overcome existing limiting aspects of TGE systems, in terms of cell lines, cell culture-based systems, and high viral titer production in a GMP-compliant and cost-effective manner. In most cases, transfection reagents that are used in small- to large-scale virus production include calcium phosphate, cationic lipids, and polyethylenimine (PEI). Calcium phosphate appears to be the economical option, but it is in fact a cumbersome transfection method that requires rigorous control and large quantities of DNA. While the use of cationic lipids leads to less inter-experimental variability, the imputed cost and cellular toxicity are detrimental to their use in large-scale virus vector production. Conversely, PEI is widely used due to its affordability, high DNA delivery efficiency, and reproducibility during upscaling in both adherent and suspension cells; unlike calcium phosphate which is inefficient for transfection of cells grown in suspension. Several PEIs of different molecular weights and chemical properties that were not specifically developed for transfection are commercially available. These PEIs are poorly characterized in terms of chemical structure and purity, and cannot guarantee high reproducibility in virus titer production. Today, with the extensive characterization and quality controls that are required for cGMP viral vector production, PEI must be sourced from qualified suppliers, and have gone through rigorous testing to ensure reliable transfection efficiencies, and hence reproducible virus production. PEIpro® and PEIpro-HQ, provided and manufactured by Polyplus-transfection®, are the unique PEIs developed for transfection and suitable for virus production from process development up to use in GMP processes. For several years now, PEIpro has proven to be the gold standard for small- to large-scale production of various viruses, notably adenoviruses, lentiviruses, adeno-associated viruses (AAV), and lately virus-like particles (Venereo-Sanchez et al., 2016). PEIpro benefits from extensive research and development in polymer chemistry and formulation—in terms of polymer structure, deacetylation degree, polydispersity index, and molecular weight. The polymer branching structure is directly correlated with the availability of protonable amines, which affects the global charge of the polymer. Formation of positively charged reagent/DNA complexes is essential to obtaining a higher transfection efficiency, rendering linear PEIs preferable to branched PEI. 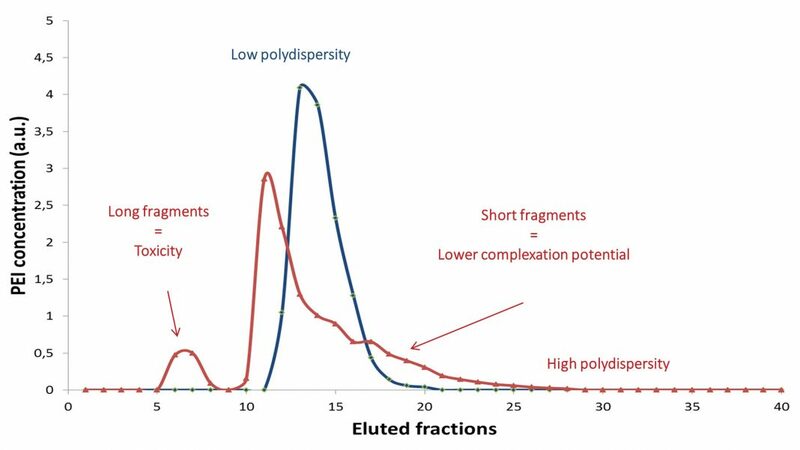 The polydispersity index should be close to 1, as different lengths of PEI in the final product lead to heterogenous, complex size formation, and to unwanted batch-to-batch titer variations. In addition, the molecular weight of PEI should be carefully optimized for high transfection efficiency with minimal cellular toxicity (Figure 1). PEIpro and PEIpro-HQ are the unique and ready-to-use commercially available PEIs that fulfill the aforementioned characteristics. To fulfill all the quality requirements associated with the use of PEIpro in manufacturing of recombinant viral vectors for clinical trials, Polyplus-transfection supplies a higher quality grade PEIpro, PEIpro-HQ. Figure 1. Optimization process of PEI polymer chemistry. Whereas long polymer fragments lead to toxicity and short fragments lead to lower complexation potential (in red), optimized PEI size with a low polydispersity index decreases toxicity, while increasing complexation potential (in blue). PEIpro and PEIpro-HQ are fully synthetic, animal-free reagents, identical in chemistry and formulation. Therefore, protocols established with PEIpro during the initial development stage can be retained with PEIpro-HQ, to keep producing identical virus titer yields during clinical batch manufacturing. 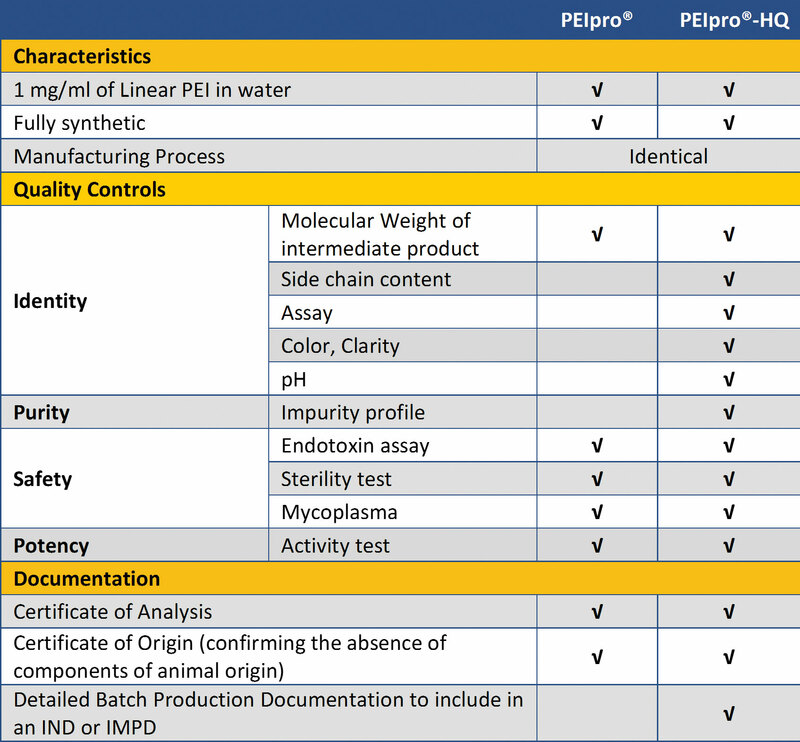 PEIpro-HQ is produced and formulated following a strict manufacturing process, with extensive characterization and quality testing to ensure that each produced batch fulfills the predetermined specifications for identity, potency, purity, traceability, and safety (Table). Accordingly, each batch of PEIpro-HQ is tested and provided with extensive documentation on the batch production and quality controls, allowing its use as a qualified raw material in GMP processes and providing confidence to clinical investigation teams and regulatory authorities regarding batch-to-batch consistency, comparability, quality, and traceability. In addition, there is growing demand to assess residual levels of any raw material used in the manufacturing process of clinical products, in order to demonstrate that raw materials/impurities are removed during purification of the final drug product. Polyplus-transfection is also developing a specific analytical method to detect and quantify any residual PEIpro and PEIpro-HQ present in the final drug product. Table. PEIpro®-HQ is a highly qualified grade of PEIpro reagent. The quality of PEIpro and PEIpro-HQ are continuously assessed during the manufacturing process with suitable control testing. In comparison to PEIpro-HQ, a more extensive number of quality controls are performed on both the bulk material and the formulated product to assess identity, purity, safety, and potency. With PEIpro and its high-quality counterpart PEIpro-HQ, a time and cost-effective solution is now available to facilitate the transition from initial optimization during process development up to large-scale therapeutic viral vector production. PEIpro, and hence PEIpro-HQ, are powerful and versatile DNA transfection reagents that can be used in most of the current mammalian cell-based TGE systems for virus production, regardless of cell types, culture conditions, culture vessels, or viral vectors used. Irrespective of the cell culture-based system and production scale, PEIpro and PEIpro-HQ have led to efficient viral vector yields superior to 107 IG/mL and 1011–1012 VG/mL, respectively for lentiviruses and adenovirus/AAV. Moreover, titer yields obtained with PEIpro and its high-quality counterpart PEIpro-HQ are superior to viral titers obtained with main competitors, notably other commercially available PEIs as well as calcium phosphate. During process development for viral production, optimization of virus production is often achieved in adherently grown cells, as this remains the standard traditional laboratory set-up. Depending on the type of viral vector, different subtypes of HEK-293 cells are preferred, such as HEK-293 for adenovirus and AAV virus production or HEK-293T and HEK-293FT for AAV and lentivirus production (Pringle et al., 2014). Commonly used adherent-based cell systems (flasks, cell factories, and roller bottles) are generally difficult to scale-up, as they favor mishandling risks during the increased processing time that manipulation of a higher number of culture vessels requires. A variety of alternative culture vessels have thus been developed, while acknowledging time and space concerns. These alternative culture vessels include multilayers flasks or fixed-bed culture systems such as iCELLis® bioreactors (Pall), which like standard culture vessels are compatible with the use of PEIpro and PEIpro-HQ. The iCELLis is an innovative solution to increase volumetric productivity, which in combination with the use of PEIpro has led to substantial increases in viral titer yields, reaching higher AAV viral titer yields of 9.0 x 1014 VG per square meter of fixed bed (Powers et al., 2016). Several animal-free synthetic media are also commercially available to maintain high productivity in cell lines adapted to growth in suspension. Accordingly, the use of suspension-based cell systems has substantially grown as they offer considerable advantages in simplifying the scaling-up process in terms of cell culture conditions, harvesting, and downstream viral vector purification steps. PEIpro and PEIpro-HQ are the reagents of choice for virus production in both adherent and suspension cells, and in serum-containing media and commercially available synthetic media. With the great momentum in viral vector-based gene therapy, the need for cGMP manufacturing has become a major concern, in terms of large-scale production and quality requirements for future commercialization. Combined with appropriate and advanced quality controls, as well as lot-release testing for PEIpro and PEIpro-HQ, Polyplus-transfection is a pioneer in offering a unique, commercially available, PEI-based transfection reagent that can support academics and biopharmaceutical companies from the initial small-scale development phase to large-scale clinical virus production. Alengo Nyamay’Antu, Ph.D., is scientific and technical support specialist; Valérie Kédinger, Ph.D., is GMP application specialist; and Patrick Erbacher, Ph.D., is CSO at Polyplus-transfection. Merten et al. Methods & Clinical Development 3: 16017 (2016). Pringle et al. Molecular Therapy 22: S141–S141 (2014). Venereo-Sanchez et al. Vaccine 34(29): 3371–3380 (2016).